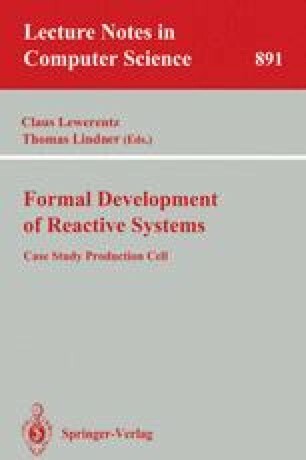 The aim of this contribution was to design a control program for the production cell using Esterel, an imperative language for reactive programming. Esterel is based on the perfect synchronization hypothesis and relies on signal broadcasting. The Esterel program is executable. It may either be simulated, or, interfaced with simple C-functions, run as a UNIX-process, or cross-compiled to be executed by a micro-controller. Some properties of the program are proven by an Esterel-compatible model-checker. The contribution explains the language and the synchronous paradigm, describes the integration of Esterel into a complete embedded system, discusses design style and use of compiler, theorem prover and graphic tool. The first section introduces to the language, the second to the design of the production cell. The third section discusses in more detail the ROBOT_PRESS module and how properties are proven, the fourth the interfacing of Esterel with the “real” environment. In the last section experiences are reported.